There are several special effects you can achieve, such a filters, drop shadows, and bevels. 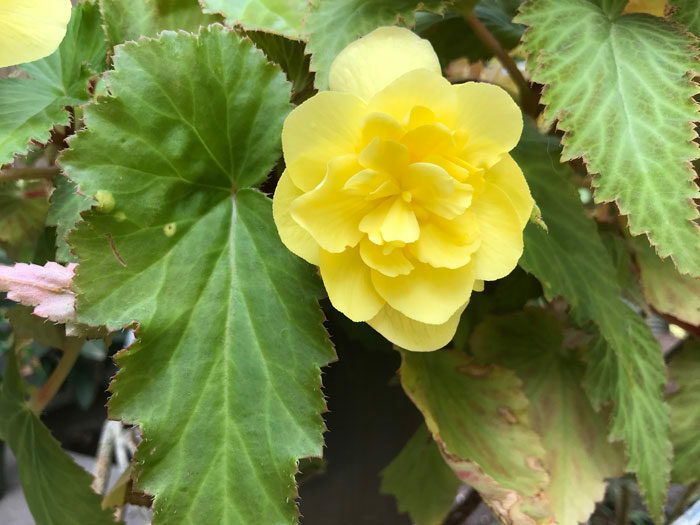 Here is a photo of a begonia from a basket on my front porch. I selected the flower from the photo, moving it to a new blank file. Then I used a pattern in filters called Angled Spectrum for the background. 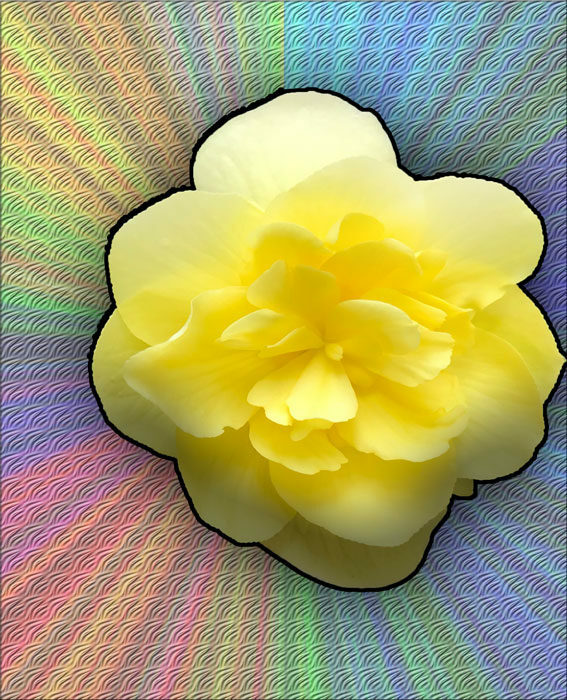 To define the flower I put a line called a stroke around it, added a drop shadow on the outside and shaded it on the inside on the lower edge. I played with the special effects with one of the paper dolls I had created in an earlier lesson. First I put a stroke around the pineapple shape then used the Tie-dye silk pattern inside of it. 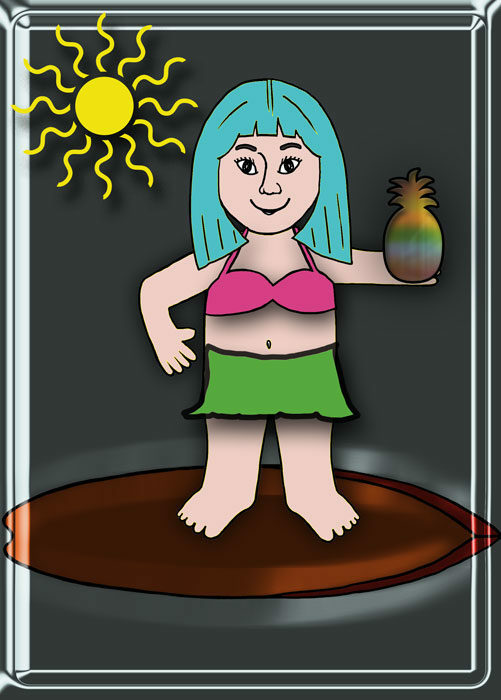 I put drop shadows around the sun, Sally’s body, her clothing, and the pineapple. I tried putting the shadow around her hair, but it was weird. It made the hair look 3-D, as if it were standing away from her body, and I understand why. 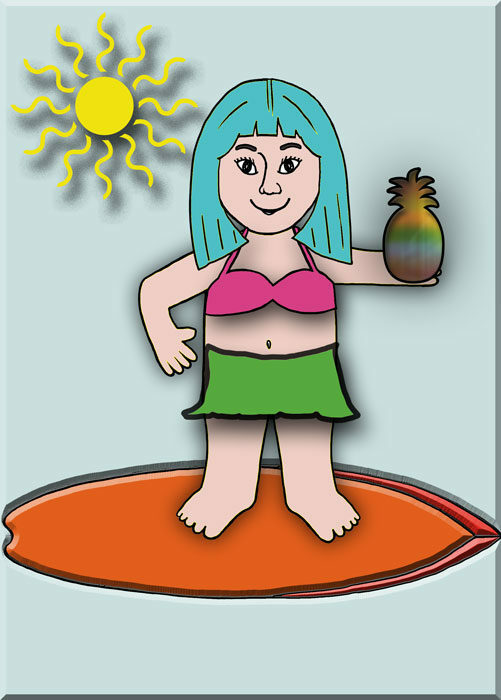 Lastly, I put a bevel around the surfboard and outer edge. Just for fun I had to try the Wacky Metallic Bevel. The results were strangely interesting, and I kind of liked it, especially the way the surfboard and sun bleed into the edges of the bevel.